Feather your nest with this sweet little handmade tile! It features a wee nest with three tiny eggs. It pairs nicely with any 2"x2" bird tile. Want it bigger? The nest design is also available in the 4"x4" size. 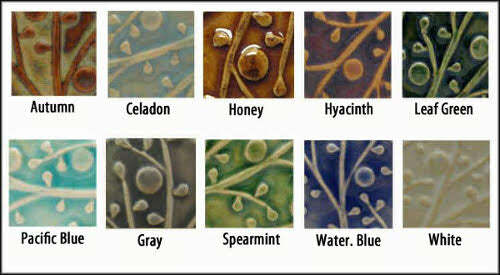 All of the glazes used on our handmade tile are non-toxic and lead free. Each tile has slot on back for easy wall hanging with a nail or hook (no frame required! ), and they are also suitable for permanent installation in many settings. The nest handmade tile is an Arts and Crafts style inspired high relief design. Emu Handmade Tiles are all high-fire ceramics for strength; they are made of thick durable ceramic stoneware clay. Emu Handmade Tiles look great framed, unframed, or permanently installed.